suite de l’adaptation du roman éponyme de John van de Ruit. Spud is still marching slowly toward puberty as a sophomore at a South African boarding school. While he’s no longer the youngest in school, that’s not going to save him from the challenges of growing up. John Cleese returns in this spectacular sequel. 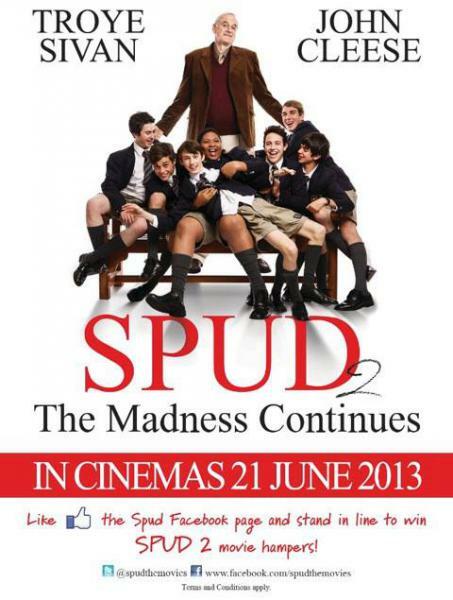 At the conclusion of Spud (an audience favorite at SIFF 2011) John « Spud » Milton had survived his first year at a private school in KwaZulu-Natal, South Africa. But sophomore year isn’t going to be a breeze. He and his friends, dubbed the Crazy eight, want to rule the school, but their boarding master, derogatorily named Sparerib, and his prefects, Death Breath and Earthworm, have set into motion a plan to get the Crazy eight expelled. Beyond Spud’s possible expulsion, he’s having romantic problems with his girlfriend, Mermaid, which leaves the door open for sultry Amanda to vie for his affections. Even his parents are causing problems as they fight though the stress of their privileged white lifestyle in perceived upheaval by the shift away from apartheid in 1991. Amidst all of the madness, The Guv (the always delightful John Cleese) provides a moral center, encouraging Spud’s civil disobedience and his personal journey of adolescent discovery. Filled with mischievous activities that only the libidinous adolescent male mind can concoct, Spud 2: The Madness Continues is hilarious, bittersweet, tragic, and real as Spud and his friends take steps toward the possibility of maturity.